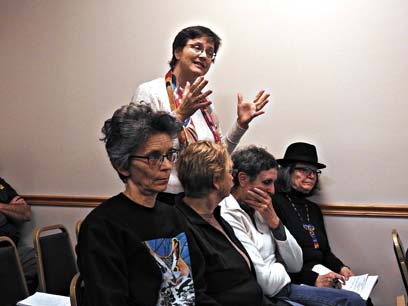 Garrett Neese/Daily Mining Gazette Resident Faith Morrison speaks Tuesday at a Houghton County Board meeting to discuss the next steps for the Houghton County Jail. A millage to create an addition to the jail was narrowly defeated in November. HOUGHTON — Everyone at Tuesday’s Houghton County Board meeting, whether at the table or in the audience, agreed: Something must be done about the County Jail. The issue before everyone is determining what and how. After an $11 million, 20-year millage proposal for a jail addition narrowly failed in November, the board met Tuesday to discuss what went wrong and the next steps to take. Because the meeting was a committee of the whole meeting, the board took no action. But the board loosened the structure of the meeting, allowing public comments throughout the meeting. Koskela attributed the vote against the jail addition in part to voter fatigue with taxes, including other millages. “I think the people got sick and tired of seeing they’re going to have to pay more taxes,” he said. Commissioner Tim Palosaari suggested putting the measure back on the May ballot as is. In talking with residents, he said, many of them believed the proposal was for a full new jail. After a standalone facility was defeated in 2010, the county should have gone out and gathered information from residents through focus groups or surveys as to why they did not vote for it. “Once you have that, there’s a process for marketing that idea I think was not used,” she said. Other residents and some commissioners said the public wanted to play more of a role in determining the goals of the project. Prior to the millage being played on the ballot this year, the League of Women Voters of the Copper Country (LWVCC) had asked the board to delay the measure to hear more ideas. Ultimately, after considering three outcomes — support, oppose or stay neutral — the League picked the third. The board’s hypothesis that previous no votes were motivated by the proposals’ cost was disproven in November, said LWVCC member Faith Morrison. LWVCC member Linda Belotte voted yes despite reservations because of what she saw as the urgent need. With the county back to square one, she recommended getting more data. A criminology associate professor told her he was willing to consult the county on doing a qualitative survey. “Please, take the time to gather the information in a professional way, to find out what all your voting base thinks,” she said. Depending on the problems of the jail population, there could also be more cost-effective ways of addressing their needs, such as recovery programs, she said. As an alternative, many residents have cited Camp Kitwen in Painesdale, a former minimum security facility closed in 2009. That site poses statutory, logistical and financial problems, according to numerous sources. One of the statutory problems is that although the jail can be anywhere in the county, the courthouse and Sheriff’s Office have to be in the county seat. That means additional travel time for court appearances. Repairs and remodeling would also need to be retrofitted at the facility at great cost to taxpayers. The facility is not secured and needs a new roof, Koskela said. Additionally, the requirement for an on-site sewage treatment plant would require five employees, costing the county about $250,000 a year, Koskela said. “The labor costs alone would put us in the poor farm,” he said. Commissioner Tom Tikkanen suggested once the new members join the board in January, it should begin looking setting up public meetings to discuss the problem. The two incoming commissioners also weighed in. Roy Britz, who will replace Palosaari on the board in January, had opposed the plan because of concerns about expansion. In talking to the architect, he said, she had told him an expansion would require closing adjoining city streets. Glenn Anderson, who will replace Anton Pintar, had supported the proposal. However, he said two things must happen before the county takes its next step: 1) It should review what it would cost to renovate and operate Camp Kitwen and make the document available to the public. 2) It should similarly do a cost estimate for an all-new facility. From a cost of $15 million in 2010 for a standalone facility, estimates since have ranged as high as $50 million.